Fresh off the announcement of its $70.9 million funding round, Redfin says it’s launching brokerage operations in four additional markets, capping a year of remarkable expansion for the Seattle-based brokerage. 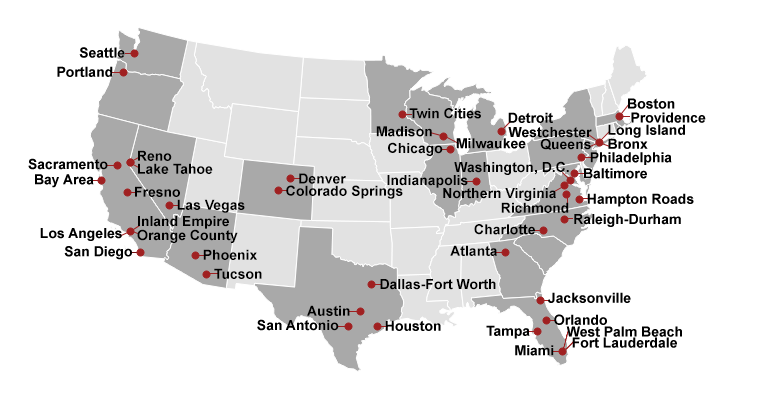 Redfin now has agents on the ground in New Jersey; Detroit; San Antonio, Texas; and Richmond, Virginia. The firm had previously powered listing searches in the latter three markets, but did not provide brokerage services. New Jersey is an entirely new market. Redfin launched an expansion push in May and, in addition to the above four markets, has since rolled into Indianapolis, Indiana; Milwaukee and Madison, Wisconsin; Tucson, Arizona; Allentown, Pennsylvania; Fresno, California; and Jacksonville, Florida. The larger geographic footprint gives Redfin broader brand exposure and the opportunity to grow traffic to its website. Although redfin.com still doesn’t provide search capabilities in many U.S. markets, it’s one of the top-ranked national real estate portals. In November, comScore data showed that Redfin attracted 5.6 million unique visitors to its site from both desktop and mobile devices, making it the fifth-most popular real estate network that month. Redfin provides brokerage services in a growing number of U.S. metros. Redfin currently powers search in the following metros: Austin, Texas; Atlanta; Baltimore; Boston; Charlotte, North Carolina; Chicago; Colorado Springs, Colorado; Dallas; Denver; Detroit; Fort Lauderdale, Florida; Fresno, California; Houston; Indianapolis; Jacksonville, Florida; Lake Tahoe, California; Las Vegas; Los Angeles area; Madison, Wisconsin; Miami; Milwaukee; Minneapolis-St. Paul, Minnesota; New Jersey; New York; Orlando, Florida; Philadelphia; Phoenix; Portland, Oregon; Providence, Rhode Island; Raleigh, North Carolina; Reno, Nevada; Richmond, Virginia; San Antonio, Texas; San Diego; San Francisco Bay Area; Sacramento, California; San Jose, California; San Luis Obispo, California; Santa Barbara, California; Seattle; Tampa, Florida; Tucson, Arizona; Virginia Beach, Virginia, Washington, D.C.; and West Palm Beach, Florida. Although consumers can use Redfin to search for homes in all those markets, Redfin doesn’t have agents in all of them. Metros where Redfin has property search capabilities but no agents include Santa Barbara, San Luis Obispo and the Lake Tahoe area in California, and Reno, Nevada. Redfin says it’s actively on the hunt to hire agents in those markets. Unlike many brokerages, Redfin agents are employees. They receive a salary and benefits and are paid bonuses based on client satisfaction. Redfin also contracts with “field agents” who help its full-time agents fulfill duties including showing houses, putting signs in a lawn and more. Earlier this year, Redfin was hit with a class-action lawsuit initiated by a former field agent who accused Redfin of paying her and other field agents as contractors, when their duties allegedly fell more in line with that of an employee.